Francis X. Clampazzo, commonly known as Clamps, is probably the most violent goon of the Robot Mafia, ready to attack anyone at any time. Clamps attended four years of clamping school and, in July 3011, worked at Planet Express (6ACV14). His brief tenure, however, was part of a plot by the Robot Mafia to find and kill Bender. Clamps' clamps are a rarely seen style of robot hand, that are apparently replaceable (Donbot offered to give Blotto a pair), and require regular maintenance. However this may be due to overuse. Clamps has a scar, riveted back together, below his right eye. As evidenced by the commentary for "Bendless Love", the producers wanted 'Clamp clamp ka-bamp!' to be his catchphrase. 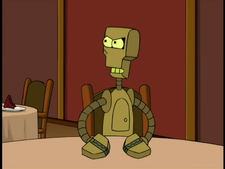 Though Clamps' first appearance is in the season 2 episode "Bender Gets Made", his real name isn't revealed until the season 6 episode "The Silence of the Clamps". According to "Xmas Time Is Fear"; Clamps needs to replace his clamps each year, "like running shoes". Unlike Joey Mousepad and Donbot, Clamps is not a member of the League of Robots (5ACV06). He danced with Gladys Lennox at the 100th Delivery Party. Clamps doesn't like his birth name, "Francis." Clamps may be right-handed, since he called his right hand (clamp) "clamp number one." Clamps: He's champin' for a clampin'! Clamps: It's gonna be clamp this, clamp that. Bada-climp, bada-clamp! Joey: They're coming straight toward our proximity. Maybe you should give 'em the clamps, Clamps. Clamps: Gee, you think? You think that maybe I should use these clamps that I use every single day at every opportunity? [shouting] You're a freaking genius, you idiot! Clamps: Alright, boss, give the word and I'll drop this unbendable girder. Clamp, clamp, ka-bamp! Clamps: Ooh, that's gotta clamp! Zoidberg: Greetings, Francis. Sorry if I was a little hostile before, but snipping is the only reason I'm even tolerated around here. Not like you, with those magnificent squeezers! Clamps: Squeezers? Squeezers?! They're clamps, you [bleep] !!!! [Clamps grabs Zoidberg by the neck and pushes him up against the lockers.] And if I wanna [bleep] ing snip wid dese clamps, I will snip with these [bleep] in' clamps!!! [Zoidberg begins suffocating.] Why do you think they call me— [Professor Farnsworth enters.] Francis? Farnsworth: Aw, Francis, you are about to make your first delivery... to the moon! Clamps' old clamps, covered in "snitch juice" (6ACV14). This page was last edited on 27 March 2017, at 04:24.